Cheltenham District Woodcraft Folk Elfins was kickstarted again in 1991, after previous leaders decided enough was enough. The batton was handed over to Maxie, Dorothy, Katharine and Duncan (with a lot of help and support from Liz). The group met in a youth centre in Pitville Circus in Cheltenham. 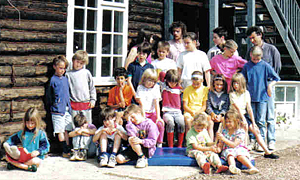 Our first weekend away took place in summer 1992, when 20 Elfins went to the Buckstone Adventure Centre, a fabulous little centre consisting of two bunk houses (one with a moose head on the chimney breast) set in a little piece of land right in the heart of the Forest of Dean. A very peaceful, very safe and very beautiful place it was too. Activities during the weekend included walking in the woods, climbing trees, scrambling over rocks, reading stories and a visit to Goodrich Castle. Unfortunately the centre is no more - it has just been closed down by Gloucestershire County Council as part of the cuts being made to bail out the bankers - the young people of Gloucestershire lose out again. 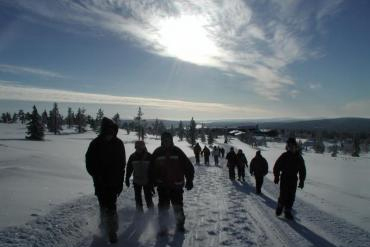 High above the Arctic Circle, about 20 Woodcraft Folk members from Cheltenham and Gloucester, mostly Pioneers and Venturers, travelled to the north of Finland in February and experienced a magical winter wonderland. Our story starts in summer 2001 at the Woodcraft Folk International Camp in the Sherwood Forest. Cheltenham and Gloucester ran a village and hosted a group from Finland and a group from Portugal. As often happens at such events friendships are made and our Finnish friends invited us to 'camp' with them the following spring. We stayed in a Trade Union college in a small town called Muonio. After flying to Helsinki we were taken by coach into the far north of the country, 17 hours before we got to our destination. Our first taste of winter was two or three inches of snow in Helsinki - which became thicker and deeper as we travelled up the country. The snow was over 18 inches deep by the time we got to the college! We arrived in the early hours of the morning in temperatures of -24c. The college building had triple glazed windows, double doors, at least four saunas and a frozen lake. So much can happen as members of the Woodcraft Folk! Click on the image to see the adventures we got up to during our week long stay in the snow.